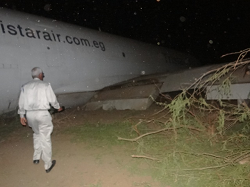 The cargo flight from Cairo, was forced to land outside the airport after multiple landing attempts failed to land at Mogadishu-Adan Adbdulle Airport after sunset. According to local media reports, the pilots have to deal with undercarriage problems, preventing a landing. With dwindling fuel reserves and no alternate airport in reach, the pilots elected to land in Arbiska, near a military base, about 25 km to the west of the city. The pilots were forced to put the aircraft down on a field close to a public road. 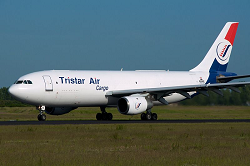 The Airbus A300 came to rest intact and all crew – except two – remained unhurt. There were no reports about any casualties on the ground. The aircraft is a hull loss. The aircraft was chartered by AMISOM (African Union Mission in Somalia) for food suplies to their troops. The crew was taken to Mogadishu by helicopter dispatched by AMISOM. For years, Mogadishu Airport is lacking an adequate runway lighting system. Mogadishu Airport is normally closed after 1800L. 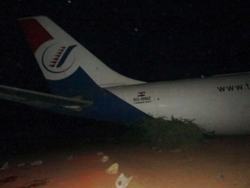 According to investigations by AvHerald, the pilots became a victim of incompetenc on the part of the local tower controller at Mogadishu who repeatedly failed to provide qualified directional assistance to the crew. Nor was he able to assess the developing emergency nature of the flight. The 1st landing approach to runway 05 was aborted because of unstabilized aircraft. The 2nd approach to runway 05 was aborted because of incoherent ATC heading instructions to join the final approach course. At this time the pilots radioed they were unable to land at the alternate destination because of insufficient fuel remaining. 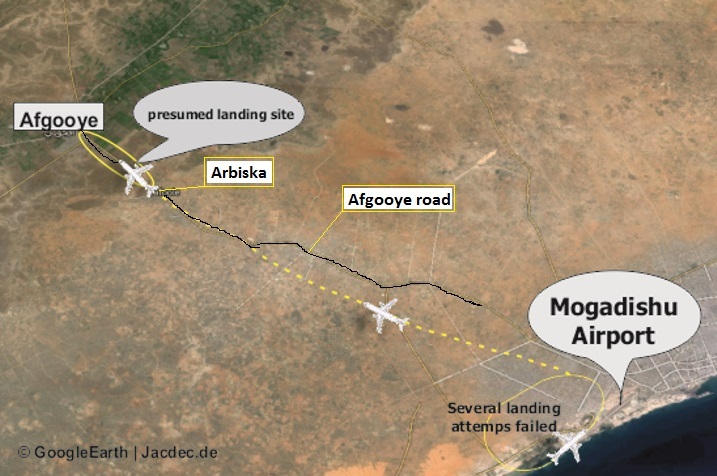 The 3rd approach – this time to runway 23 – was aborted after the tower failed to provide landing clearance and insists that a landing on that runway is strictly forbidden because of security concerns. The 4th approach to runway 05 was aborted for reasons unknown while daylight decreases making it difficult for the crew to spot the unlighted runway. The aircraft as given vectors taking it to the north of the airfield when fuel reserves dropped down to almost zero. After both engine flamed out, an emergency landing in the open was carried out. 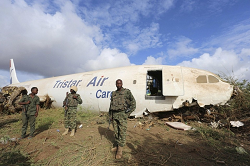 According to preliminary investigation and testimony of the local tower controller by Somali authority SAAIA (provided by AvHerald.com), the controller reported he repeatedly informed the Kenyan sector that the A300 would land after the closure of Mogadishu Airport at 1800L and advised to land at an alternate airport instead. 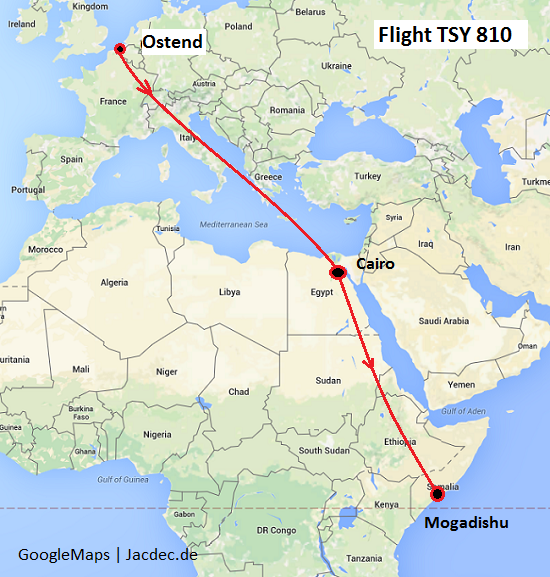 Their preliminary report is directing the blame away from the somali air traffic control, stressing the point that the pilots should have taken the operating hours (as shown in the NOTAM) of the airport into their pre-flight considerations. The lack of any lighting infractructure at the airport was confirmed.